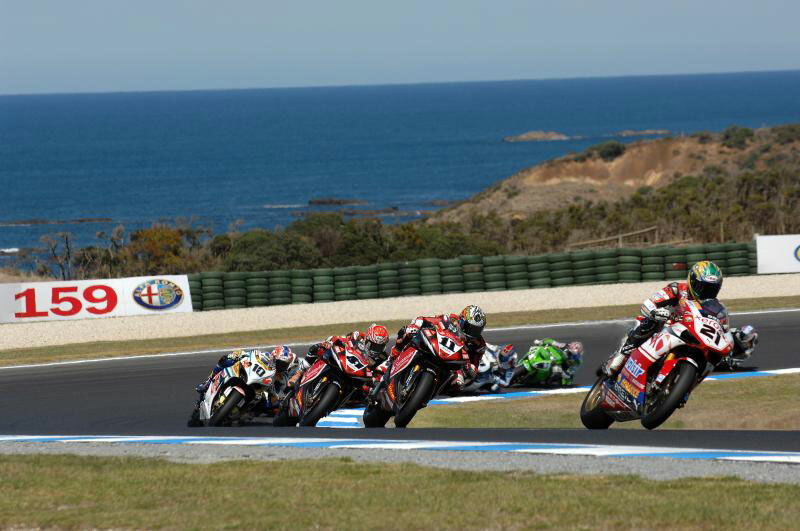 Ducati rider Troy Bayliss enjoyed a spectacular island getaway on the weekend, winning the Australian double-header in World Superbike as competitors followed him like groupies chasing a superstar in both rounds. Bayliss has announced that this will be his last year in Superbike racing, so the home-turf double-win was special. 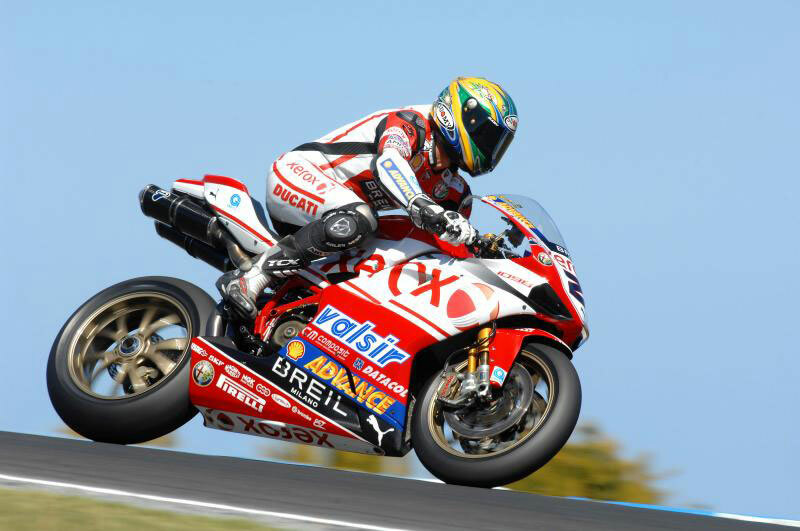 The first round at Phillip Island Raceway started explosively, as fellow Ducati rider Michel Fabrizio stalled on the line and was hit from behind, leaving him limping off the track, his right boot knocked off in the impact. A few seconds later on the other side of the track, Carlos Checa, slowing down under a red flag, was hit from behind by Australian Russell Holland, causing both riders to depart from their Hondas. After the restart, Bayliss moved quickly into the lead, and won the first race by 4.2 seconds over Yamaha-mounted Troy Corser and knocked-off Ducati teammate Fabrizio, who apparently found his right boot. Ducati rider Max Biaggi threw down some heavy challenges for the lead, but crashed out of second place. In Race 2, Corser took the lead early, but crashed, giving the front to Bayliss, while behind him an Aussie troupe of Spanish riders fought for second place. Carlos Checa eventually claimed second, with Fonsi Nieto on a Suzuki taking third. Max Biaggi managed to crash out of this race, too, but broke his wrist in the deal. Too bad, because Biaggi provided some terrific racing for the fans. Bayliss leaves Australia with 88 points. Fonsi Nieto is second with 61, Corser is in fourth with 45, and Biaggi is in seventh with 36 points.